MuskieBait Adventures: Spoon fed salmon finally avenged! Spoon fed salmon finally avenged! Before I dive into the real story, I was fishing at a creek earlier in the morning. Something pretty rare happened. This immature Chinook Salmon, around 3-4lbs, CHASED!!! my roe bag while I was retrieving the line to start a new drift. The roe bag was moving, with speed and unnaturally, UPSTREAM! I've only seen this happened a couple of times over the years. This fish didn't enter the river to spawn. It sat behind the school of salmon waiting for eggs to drift by and it would feed on the loose eggs. Apparently, it really wanted my roe bag. About 10 minutes after, it found my roe bag again and the float was yanked down HARD! It fought with more energy than some of the 15-20lb spawn-ready salmon. Simply beautiful fish and full of vigor! It was so stunningly emerald and chrome (for a river salmon) I just had to share. Anyways...now for the REAL story! For over 15 years, I've fished the fall salmon run. In my very early days of salmon fishing, I fished in the rivers for spawning salmon. Later on, my friends showed me how to cast spoons at piers and river mouths for actively feeding fish that were staging for the spawn. Through the 10+ years of casting spoons, I've only EVER hooked one salmon long enough just to lose it, 200 yards run later, to a line break. Since then, I've only had a handful of short hits on the spoon. In 2007, I visited British Columbia to fish for salmon. At the Skeena River, I hooked a 30lb class Chinook (King) Salmon on the spoon and fought it for over 20 minutes, only to have the net guy messed up the job and the barbless hook subsequently fell out of the mouth. The fish was so shallow that net guy could have even scooped it up with his hands...but anyways, the fish was lost. On the same trip, I was casting spoons for Coho Salmon at the Capilano River and yet again had a solid hit, a hook up but ended with the fish jumping off a few seconds later. In 2008, I was back in British Columbia and had pink salmon and chum salmon chase spoons and had a couple of missed hits on the Kitimat River. I've since caught salmon on the float rod and fly rod, and trolling from friends' boats, but my goal to catch a salmon while casting spoons remained to be realized. 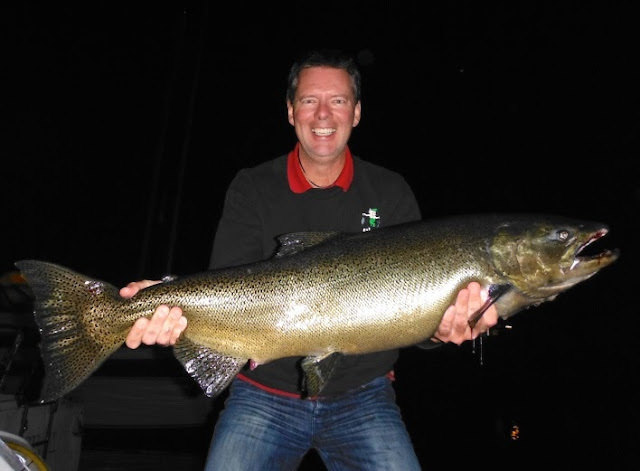 Last fall, my friend Richard invited me to fish from his yacht club's docks. 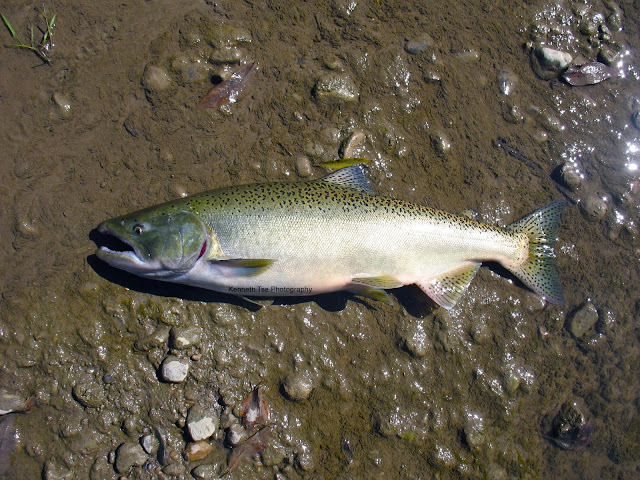 Salmon invades the marina between September and October for 4-6 weeks. Last fall, I put in 3 evening sessions but didn't even had a bump while Richard landed four Chinook Salmon fishing beside me. 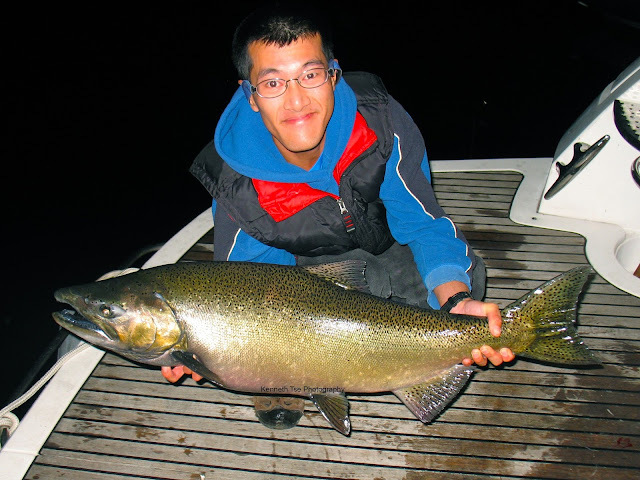 Thursday evening was the first time I fished for salmon this fall. Like the three previous trips, I didn't even get a bump while Richard had a fish pulled the hook right by the dock. I met up with Richard at 6:30pm at his slip. He treated me to dinner before we started to cast for pike for a bit. The pike were not active, so once dusk approached, we switched to glow spoons. Here and there, we could see salmon splashing on the surface. The odd ones would jump clear out of the water, often multiple times. Seeing splashes and jumps were signs that active fish were in the area. Richard often cast off the swim platform of his boat. Tonight, he gave me his prime spot while he cast from the dock. It must have been 8pm when I saw a swirl about 10 feet away from the boat that was docked two slips from us. I was pretty confident that fish were around. A few casts later, I had a good hit that pulled drag on the hit. However, the hooks did not set. Another 10 casts later, I had yet again another solid hit that stayed on for two seconds before the fish let go. Sometimes, if the fish struck the spoon at certain angles, the hooks may only find the bony areas of the mouth. Only when the hooks find the corner of the mouth would landing percentage increase. It must have been another 15 minutes later when my rod was ripped hard. The fish initially gave short spurts of acceleration only. It wasn't until a minute later that the fish decided to go on a long run. These fish knew safety was to be had by swimming back to the lake, so the fish was headed out of the marina. But with my beefy gear turned the fish before it could swim off 150 yards. A give-and-take battle then ensued until the fish was close to the swim platform. Richard had the net ready and I led the fish toward the net. With a scoop, the fish was in the bag. As we lifted the net up, the fish somehow fell back into the water. In a moment of scramble, we didn't really know what happened. I thought perhaps the hooks was entangled in the net and the fish had managed to unhook itself and fell back into the water. Richard then saw that the fish had tore a hole in the net, and luckily the fish was still on the line. For a few tense moments, I was fighting the fish through the hole in the net. Luckily, I had also brought my net. With some careful maneuvering, we managed to net the fish with my net while the line was still going through Richard's net. Sometimes a great catch needs a dose of luck. After this, it went a little quiet for 15-20 minutes when I was hit again, only to have the fish dropped the lure again. As the night progressed, fish seemed to have left the area. It was not until around 10pm that Richard finally hooked one! The fish hit very close to the dock. Strangely, this fish did not go on a long run, only to twist and turn by the dock a short length from the rod tip. The fight also lasted relatively short, maybe just 3-4 minutes, before I put it in the net. It was a heavy one, a fish that needed Richard's extra hands to hoist it up the dock. She measured out 38.5" long, and we estimated her to be at least 25lbs. We continued to fish until 10:35pm, but it was really quiet after the last fish, so we decided to end the night early. Thank you Richard for helping me accomplish a goal that had started over 10 years ago!!! Years ago a friend and myself started chucking "heavy metal" for salmon near Old Mill. He'd land a half dozen for my single bite even though we were using identical tackle. It turns out a mild application of Deet keeps more than mosquitoes away. I've since committed to salmon on the fly rod and get bitten all too often.